Two men have been found guilty of causing or allowing the death of a 17-month-old boy. The child's mother had already admitted allowing or causing the child's death. The trial highlighted a catalogue of missed opportunities to save his life and the case has chilling echoes of the death of Victoria Climbie. On 2 August 2007 police announced they were dropping an investigation into allegations of child abuse they had launched the previous December. Baby P's mother was elated and told social workers she would go home to hug her son and bake cakes. The next morning he was dead. Baby P, who cannot be named for legal reasons, was pronounced dead shortly after midday on 3 August at the North Middlesex Hospital in Edmonton, north London. But it was already clear when an ambulance arrived at his Tottenham home 45 minutes earlier that he had been dead for some time. His mother described him in her 999 call as "blue, cold and stiff." In his short life he had suffered repeated - and unexplained - injuries. • Eight broken ribs and a broken back, with another area of bleeding around the spine at neck level. • Numerous bruises, cuts and abrasions, including a deep tear to his left ear lobe, which had been pulled away from his head. • Severe lacerations to the top of his head, including a large gouge which could have been caused by a dog bite. • Blackened finger- and toenails, with several nails missing; the middle finger of his right hand was without a nail and its tip was also missing, as if it had been sliced off. • A tear to his fraenulum, the strip of skin between the middle of the upper lip and the gum, which had partially healed. • One of his front teeth had also been knocked out and was found in his colon. He had swallowed it. 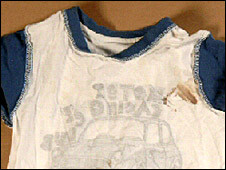 The jury was not shown photographs of the child's actual injuries because it would be too upsetting but was shown computer generated images of his injuries. His mother, who is now 27, told her GP in September 2006 that her son "bruises easily" and she was worried she might be accused of hurting him. The following month she returned to see Dr Jerome Iqwueke and explained away bruises on the child, saying he had fallen down the stairs the day before. On 11 December 2006 Dr Iqwueke saw the child again and noticed more bruises, none of which the mother could adequately explain. He immediately referred Baby P to paediatric specialists at the Whittington Hospital, where doctors concluded the marks suggested non-accidental injury. Haringey social services were notified, Baby P was put on the child protection register and a police investigation began. Five days later he was released into the care of Angela Godfrey, a close friend of the mother. At the end of January 2007 social services decided to return Baby P to the family home. Dr Heather Mackinnon, the paediatric consultant in charge of Baby P's care at the Whittington, said she had been unable to attend various case conferences concerning him but had made her report available. She said she would not have supported returning the child to his family. She also said she did not receive the minutes of any of the meetings until after Baby P's death eight months later - something she described as "clearly a systemic failure". Dr Mackinnon said many of those involved in the case felt sorry for the mother and she said there was "a collective thinking that this was more likely to be neglect rather than deliberate injury - which was not my view". The police officer investigating the suspected abuse, Detective Constable Angela Slade, said she had also been opposed to Baby P returning to the family home because her investigation had not been completed. But she said she was told by social services the mother was working well with them and a delay in returning would affect the re-integration of the family. Social services had also been given assurances - which proved worthless - that the mother was living alone and there was no man in the house who could have inflicted the injuries. During the trial the mother admitted this was a lie. The court heard that her 32-year-old boyfriend, who cannot be named for legal reasons, was frequently left in charge of Baby P and the first injuries coincided with his growing involvement in the household. 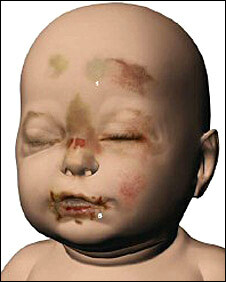 Baby P was taken to hospital twice more, in April and June 2007, with unexplained cuts and bruises. The mother lied to social worker Maria Ward that she was away, which delayed a home visit for another six weeks. When Ms Ward saw Baby P for the last time, a few days before his death, she found him sitting in his buggy, with a sore ear, a gauze over his finger and chocolate smeared over his face and hands. Two prosecution witnesses claimed the mother and boyfriend had deliberately spread the chocolate on his face to hide bruises. Baby P's final two weeks of life were marked by an escalation of the violence against him. On 25 July Dr Iqwueke received a call from the mother, requesting his help to get social services "off her back". When she brought the child in the following day the doctor noticed he was "withdrawn" and avoided contact. The prosecution claimed the child's back and ribs would have been broken before 1 August, when his mother took him to a child development clinic at St Ann's Hospital where he was seen by Dr Sabah Al-Zayyat. In a police interview Dr Al-Zayyat said she had been unable to carry out a full physical examination because he was "miserable and cranky". But in court she said Baby P only cried for a minute or so before she began her physical examination and he was in the room with her for over an hour. Asked why she apparently changed her evidence she replied that the police had not asked her the right question at the time. Dr Al-Zayyat denied his back could have been broken when she saw him. It emerged during the trial that the mother had been placed on a parenting course, had been given stair gates, a fireplace guard and, even, shortly before his death, an offer of a seaside holiday. This is not the first time Haringey social services has come under the spotlight. 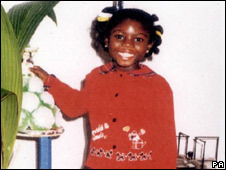 In February 2000 eight-year-old Victoria Climbie was killed in Tottenham after a number of failings by Haringey social services and other agencies. The public inquiry that followed, headed by Lord Laming, criticised the lack of communication between the different agencies and suggested an overhaul of child protection guidelines. But Mor Dioum, director of the Victoria Climbie Foundation, says the lessons have not been learned: "I strongly believe this case is worse than Victoria Climbie. "Personally I do feel betrayed by the agencies. Given the government's extensive reforms of the child protection system I never though I'd live to see another case so similar to Victoria Climbie. For the sake of public interest we ought to have a wider inquiry into this case to identify the mistakes made."